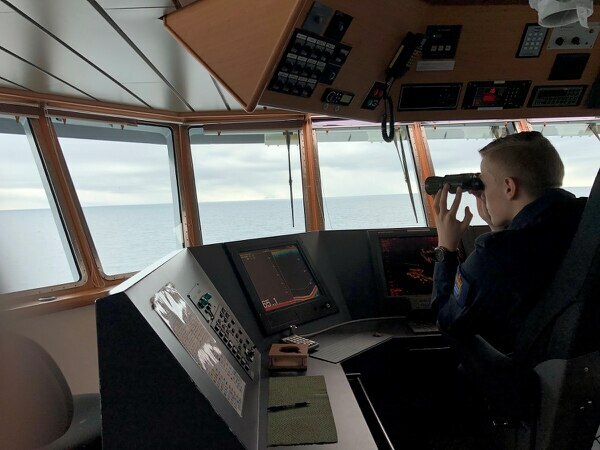 ABOARD THE NORWEGIAN COAST GUARD VESSEL HARSTAD IN THE GREENLAND SEA — During the three weeks the Norwegian Coast Guard vessel Harstad sailed around Svalbard in late May, it was the only military ship available to respond to a crisis in the vast waters surrounding the island. But that reality is the norm and likely will be for a long time, even as demands on the service grow by leaps and bounds, said the Harstad’s commanding officer, Lt. Cmdr. Kyrre Einarsen, on May 23. Svalbard is Norway’s northernmost island, a landmass about the size of Ireland situated in the Arctic Circle. Although Svalbard is considered the sovereign territory of Norway, and thus can be defended by NATO if attacked, it is governed by a 1920 treaty that forbids any country from building a military installation there. 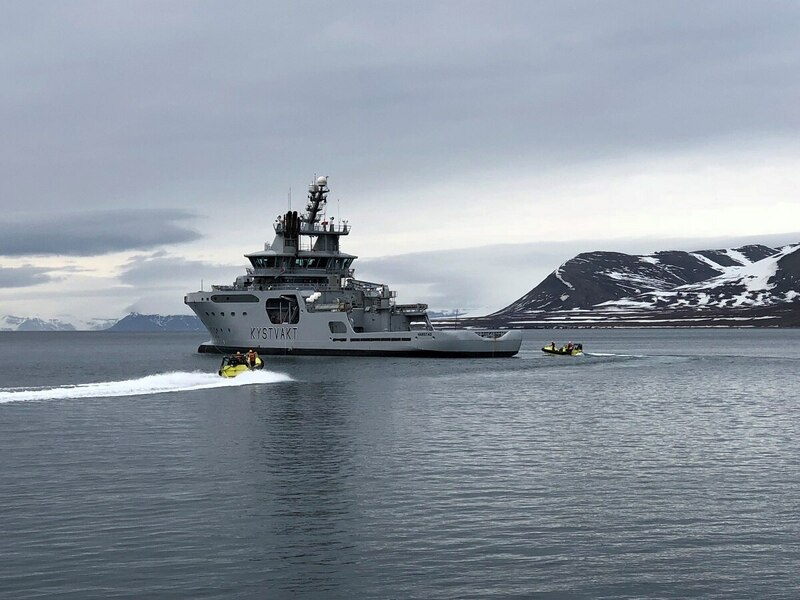 For that reason, the job of securing Svalbard falls to Norway’s Coast Guard, a 350-person force with only 13 ships to patrol the country’s waters, which amount to about seven times the area of its mainland. Of that inventory, only one vessel can be spared at any given time for Svalbard’s needs. “With our structure today, it’s not possible to be always present,” said Einarsen, who said that two or three vessels could be needed in the future to accomplish all of the missions around Svalbard. Defense News traveled to Svalbard the week of May 20 with a group of current and former U.S. Defense Department officials, foreign policy experts and journalists during a trip sponsored by the Atlantic Council and the Norwegian government. Defense News accepted travel and accommodations during this trip. There, officials from the local government and academics studying the environment shared the same message: Things in Svalbard are changing, spurred by climate change and the fact that the ice in the Arctic Circle is receding. Cruise ships and fishing boats can now reach areas that would normally be covered by a permanent sheet of ice. Greater numbers and numerous types of fish are moving north, making the fishing business even more alluring. And tourism to Svalbard has exploded. In a given year, the entire Norwegian Coast Guard will accomplish upward of 3,000 missions, both large and small. But with only a single ship in Svalbard, the service is hard-pressed to do all of the tasks to which it’s assigned. “We have to prioritize. We have to say: ‘No, no we can’t. We won’t do that for you today. Maybe we can do it next week,’ ” Einarsen said. The Harstad, which Norway bought in 2009, can do a lot of missions, with some caveats. It can tow a ship weighing up to 100,000 tons, conduct firefighting duties, and deliver water or fuel. In addition, the Harstad can recover 12,000 cubic meters of oil — making it one of the Coast Guard’s best ships for responding to an oil spill. But that may not be enough for major accidents, Einarsen acknowledged. “That can be enough because that depends how big the spill is,” he said. “But the biggest ship can have more oil onboard sometimes” and another ship may need to be called in to respond. The Norwegian government has proposed forward-looking capacity-building measures to bolster the fire-power of the country’s military organization while reinforcing capabilities in its substantial and strategic High North border areas with Russia. 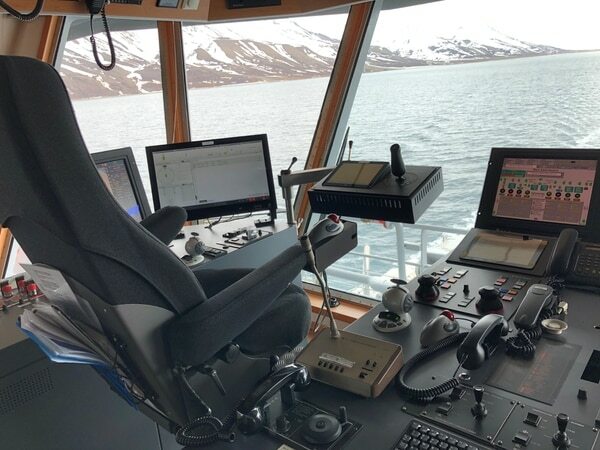 The biggest challenge for Coast Guard patrols around Svalbard is identifying which fishing boats are illegally discarding fish, Einarsen said. The waters surrounded Svalbard have been designated a fisheries protection zone, which allows companies from Russia and other European nations to fish as long as they promise to abide by fishing quotas and other governance. To enforce those laws, the Coast Guard relies on surprise inspections and aerial surveillance. However, the latter capability is currently constrained by a shortfall of maritime helicopters. Norway divested its Lynx helicopters in 2014, and its Air Force should have eight new NH90 helicopters dedicated to Coast Guard requirements. However, it has only four or five NH90s for the Coast Guard mission, which are made by a European consortium led by Leonardo and Airbus, and they are not fully operational, Einarsen said. “Our ability to detect and the surveillance picture around us is getting worse because we’re not able to put out a helicopter,” he said. Norway and the U.S. will reach a new level of collaboration when it comes to defense after inking an arrangement at a conference in Washington. And while the service is considering purchasing drones in the future to help augment the surveillance mission, it currently doesn’t operate any unmanned aerial systems. Thus, it has been relying on civilian-operated Beechcraft 350ER aircraft owned by Norway’s civilian Coastal Administration . That aviation shortfall also impacts the Coast Guard’s search and rescue capability, another key mission the service must accomplish around Svalbard. Should there be an accident involving a cruise ship, for instance, helicopters would normally be called to provide rapid response. The leased fixed-wing Beechcraft 350ERs could come in to drop supplies like survival kits and life rafts, but it wouldn’t be able to pick up people in need of an immediate rescue like a helicopter could, he said. Once the single Coast Guard ship patrolling Svalbard arrived on the scene, it could respond to most cruise ship accidents, depending on the size of the vessel. “A big cruise ship with 2,000 passengers is not possible,” Einarsen said, adding that the service would have to call on civilian and supply ships to help. Some relief may be forthcoming as the Coast Guard divests some of its older ships for new ones with greater capability. As early as 2020, Norway’s Coast Guard could receive the first of three Jan Mayen-class ships. These multipurpose vessels will have a length of about 130 meters and will be able to carry special operators and helicopters. They are also designed with an icebreaking capability and will be able to withstand winter temperatures up to minus 30 degrees Celsius. “If all is going OK, they will start to build it next year, 2019, in Norway,” Einsaren said. The three Jan Mayen-class vessels will replace the three Nordkapp-class ships built in the early 1980s. Besides the Nordkapp class, the only other ship the service owns that can accommodate helicopters is the Svalbard, only one of which was produced. In addition to the Jan Mayen, the Coast Guard will also lease two civilian tug ships beginning in 2020. However, those ships come with greater responsibilities, as the service is taking over the tug readiness mission from the Coastal Administration.